During the hardest times of my life, I had trouble consistently reading the Bible and connecting with God. Even though I was a Christian and wanted to honor the Lord with my life, which included being faithful in daily prayer and Bible reading, I found myself feeling distant from God. Whenever brain fog from Lyme Disease and co-infections would come on strongly, I would be faced with a block in my mind. That mental block left me unable to pray or comprehend scripture in the way I desired. I just didn’t feel connected to God anymore. 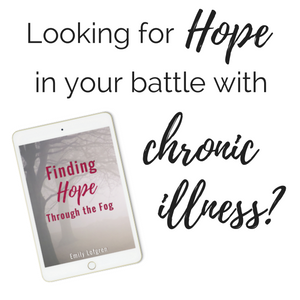 In Finding Hope with the Fog (get your copy – it’s free! ), I share about the way God met me in one of my weakest moments when I was having a panic attack. He used the Psalms to remind me of how good He is. He showed me that I can always turn to Him in troubled times even if I can’t always feel His presence. Reading the Psalms is something I now do regularly because I can connect to the emotions of the Psalmists and am always reminded of the bigger picture in our suffering. It may feel as if God is distant and He doesn’t hear our cries of suffering, but that’s not true. God knows. He loves us and He will respond and be our place of refuge! As, we are reminded in Psalm 9:10, the Lord has never forsaken those who seek Him! So, I encourage you, no matter where you are in your journey of chronic illness or regular life weariness, to seek Him. But as for me, it is good to be near God. I have made the sovereign Lord my refuge. I will tell of all your deeds. Record my lament; list my tears on your scroll – are they not in your record? I can totally understand. I felt the same way. I been suffering from fibromyalgia. Last year was real difficult. I dealt with so much pain. And no one could figure out why. Until this year. Now we trying to find something to control the pain. May God bless you with your journey. Thank you so much for sharing this! I have had chronic illness for the last 6 years, one of which is Lyme disease. Thank you for your encouragement, I’m facing some tough health issues again on this roller coaster and about to have surgery. I’m so glad I found this!! You are very welcome, Abby! I’m so thankful that you’ve been able to find encouragement. Praying for you as you recover from surgery!! Thanks for letting the Lord use you in such a mighty way. I have been blessed! God Bless You and I Pray for You! Thank you so much, James! He has been SO faithful! I’m in a place of bad fatigue and brain fog..,I need to be reminded every day of his faithfulness. I’m sorry to hear of the place you have been in, Marya! He truly is faithful, but sometimes it is hard to see and understand in the moment. A dear friends daughter is fighting Lyme Disease. My heart aches for the entire family. Trusting in God, faith, daily prayers, sending support, reaching out in anyway no matter how small….It will make a difference on those awful days. I am out here, one of those without this horrible disease, and I pray daily for all of you . Hi Wynell, I’m sorry to hear about your friend’s daughter’s fight with Lyme! It’s a BIG challenge to endure. I’m so glad to hear that you are supportive of her and of others who are dealing with this. Thank you for your prayers!! I just stumbled across your blog on Pinterest and love what I’ve seen so far! The Psalms are such an inspiration, and I love that you talk about how they lend perspective to our suffering. Thanks for sharing! Thanks, Emily! It is awesome to share God’s words. It is good to let God’s truth seep into your soul. I thank God for Christ Jesus’ sacrifice for me that I can overcome through Him! His Spirit comforts always, Hallelujah! Amen! Thanks so much for reading, April. God is sooooo good! I love the way he loves us so tenderly! So glad you found it encouraging, Judith! Thank you for reading! Just stumbled upon this post. Thank you for sharing. I have some chronic illnesses as well, and I go back to the Psalms time and time again. There were some on your list I haven’t read in a while that I think I am going to try to memorize. :) I love your blog, BTW. Keep up the great work! Aww, thank you so much, Ally! I’m sorry you also have some chronic illnesses but I am glad the Psalms are encouraging to you. God’s Word really does provide comfort during our hardest times! Thanks for this great list! May your New Year be blessed and full of healthful moments. Thank you so much, Melanie! Hope your year is off to a good start! Thanks so much for stopping by, Nicole! Glad it was encouraging to you!